I added all the content from Brotherhood of Radiation to the Modern d20 NPC generator. I know it's totally Web 1.0, but it works! The final installment of the Darwin's World Savant Series, Last Gambit of The Mind Masters, is now on sale. I created a bundle+ for the adventure series. 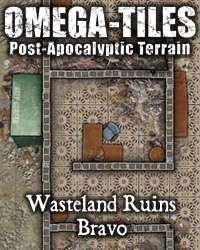 Tiles from OMEGA-TILES 02: Wasteland Ruins Bravo are now in Tiamat. It's been almost a year, but we have released a new Post-Apocalyptic Dispatch! Issue #23, Skinner's Furs & Pelts, is now on sale. It's in the same vein as our most popular dispatch issues such as Professor Gigabyte's Data Salvage, Manqala Den, and Moe's Moving Picture Emporium. While we recently released Darwin's World Savage Worlds: Survivor's Handbook, we haven't released a d20 DW book since Gencon. People asked for an update on the DW yahoo group and I wanted to oblige. I don't want to give any ETAs, but here's a progress report on the books listed in the upcoming section of DW. Dominic is nearing completion of The Brotherhood of Radiation after a delay, which I'll allow him to explain in his own words. "The Brotherhood book is near to completion, but I got stalled by the release of Fallout New Vegas. Since existing material on the Brotherhood has always set the cult in and around Vegas, I felt it was cheesy to try and put it out at the same time. I didn't want to be influenced by Fallout New Vegas as I wrote, nor have people think I was ripping the game off since several chapters have to do with a post-apocalyptic Vegas. Anyway, I want to make some changes to the manuscript, and I need to finish polishing up some of the content." Last Gambit of The Mind Masters is another story. Dominic as of right now is unable to finish this adventure. Most of it is complete. What is not complete is fully outlined. At this point I'm going to take responsibility for finishing it. This might mean I will personally finish writing it or work with other writers to bring it to completion. So that's where things are at. I don't want to give any ETAs because I never hit them, but just know things are in the works and progressing. 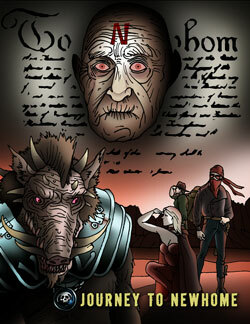 I just sent a coupon to the RPG Coupon google group for Secrets of The Mind Masters for $2. You can still get the coupon by Joining the group. Suffering from gamer ADD, I ignored Tiamat for a bit to redo the layout for Darwin's World Savage Worlds. I submitted it to Peginc and await their approval. Then Dominic sent me a finished draft of Somewhere In Between, and since I was already in the thick of it, I continued editing and layout. With it nearly complete, expect Somewhere In Between to go on sale Monday.